GMAT Student Trends: What Do Your Fellow Test-Takers Want To Do With Their GMAT Score? Yesterday, the Graduate Management Admissions Council (GMAC, the organization that makes the GMAT) released its annual mba.com Prospective Students Survey, a wide-ranging study of nearly 12,000 prospective GMAT-takers and graduate-school-applicants. While this survey is designed primarily to target the needs of graduate schools, there are some interesting data points that you, the aspiring student, may want to know. Why do people want a graduate business degree? Career switchers (38% of respondents): these prospective students are looking to switch industries or job functions and hoping that a graduate degree will give them the boost they need to make the change successfully. People in this group are more likely than the overall pool of respondents to be age 24 or older and living in the U.S. or Canada. The size of this group has dropped by 8 percentage points in the last 5 years, perhaps not surprising as the economy has picked up since 2010. 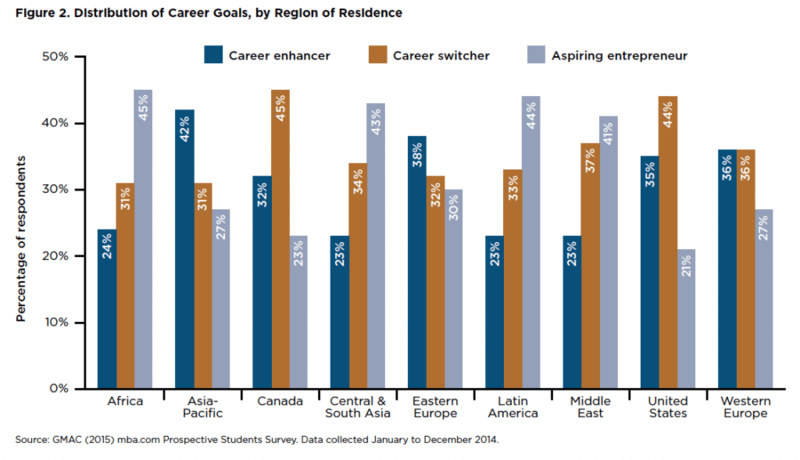 Career enhancers (34%): these prospective students are seeking a graduate degree primarily to enhance their existing careers, whether planning to keep their current jobs or move to a new employer. People in this group are more likely than the overall pool of respondents to be female, under the age of 24, and living in Asia-Pacific, Europe, or the U.S. The size of this group hasn’t changed much in the past 5 years. Aspiring entrepreneurs (28%): these prospective students hope to start their own businesses, possibly even before they earn their degrees, though only about 10% have already started businesses. People in this group are more likely than the overall pool of respondents to be male and living in the Middle East, Africa, Central or South Asia, or Latin America This group increased by about 9 percentage points in the past 5 years. What does that mean for you? First, it’s just interesting to know. 🙂 Second, it gives you a sense of whether you are coming from a more “common” demographic or whether you will stand out more from the crowd. If the former, then you’ll want to look for other ways to make your story stand out. Want kind of degree do people want to get? What kind of program do they want to attend? The survey includes some very interesting data about the types of degrees people want. First, let’s address the two main categories of degrees: MBA and specialized. A little over half of the respondents were firmly focused on MBA degrees, while about 22% said that they want a specialized degree (such as a Master of Finance). The remaining 26% were considering both types of programs (it was unclear whether they are considering getting a dual degree or whether they just haven’t made up their mind about which type of degree to get). Check out the graph below. Of the people considering only an MBA program, about 32% were most interested in a full-time 2-year program and 27% were aiming for an accelerated full-time 1-year program. For those considering only a specialized degree, Master of Accounting and Master of Finance programs are by far the most popular programs. The below data reflects two combined categories: those who know they want a specialized degree and those who are still considering both types of degrees. There are distinct preferences by region for the two most popular specialized degrees. There’s strong interest in a Master of Finance degree in Asia-Pacific and Europe. Those considering a Master of Accounting degree are most likely to live in the Asia-Pacific region or the U.S. If you’d like to read more, hop on over to the GMAC website and download the full report. If you have any interesting insights to share, or want to discuss something you find intriguing, let us know in the comments! The GMAT® is property of the Graduate Management Admissions Council. All data cited is from GMAC’s 2015 mba.com Prospective Students Survey. 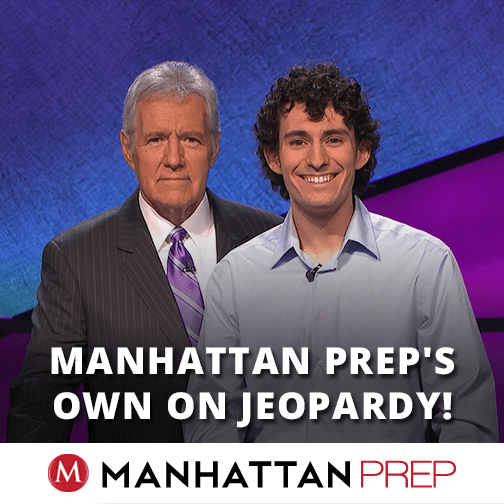 Yesterday, the whole wide internet was shocked by the Jeopardy dominance of “This dude Michael”, but here at Manhattan Prep we weren’t surprised at all. We already knew that dude was smart and we knew that dude had the mathematical wherewithal to bet $7,000 without batting an eyelash. Here at MPrep we know that dude as Michael Bilow (one of those people who command such respect that he must always be talked about using his last name lest anyone in earshot mistakenly attribute an anecdote or joke to some less deserving Michael). On Jeopardy, he lived up to his legend taking home the fourth highest single-day winnings in Jeopardy history: $57,198. Michael Bilow joined the Manhattan Prep family in 2011 using his perfect GRE score and spectacular teaching chops to secure a role as an LA-based GRE instructor. A few years later we realized we needed more Bilow in our business so we asked him to join the Marketing Department. He took a position as our Business Data Analyst, while continuing to teach GRE classes and pursue his PhD. After seeing him flawlessly juggle those responsibilities, we never had any doubt that he would take the Jeopardy world by fire. By now the whole country knows of Bilow’s intellectual prowess, but we know so much more. Michael is a dedicated practitioner of improv, a delightful presence in Google Hangout meetings, and a stylish dresser. We can’t wait for his next trip to the New York City headquarters so he can buy us a drink with his winnings after he takes a quick a nap in a tutoring pod. Congrats, Michael Bilow! Keep it up!